This reading by Schumacher asked me to reflect inward upon thoughts of living locally, my material wants and what work could be. J.C. Kumarappa says [work] ‘nourishes and enlivens the higher man and urges him to produce the best he is capable of.’ This is in line with one of Schumacher’s three Buddhist points of view on work: ‘to give man the chance to utilize and develop his facilities.’ What does this mean for me and on the larger scale of my office and community? If I was free from the thought of work enabling a paycheck, and put more focus on the type of work I was doing I would work to promote downtown Morgantown. This city allows density and a walkable community to take care of basic needs: food, shelter, and cleanliness. A farmer’s markets, a food co-op, a drug/general store, clothing stores, restaurants, and plenty of apartments in need of maintenance exist here. Morgantown has libraries, a theater, and a university. Focusing on the place where I’d like to see the change is key. 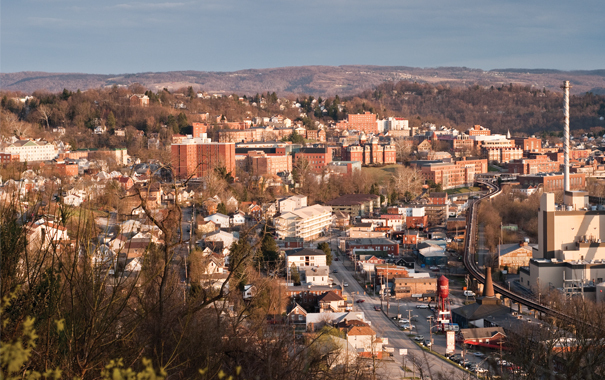 The fortunate thing about Morgantown is that the city is not stagnant. Investors are building apartment complexes and commercial retail buildings everywhere. What if these people felt responsible for the upkeep of their community too? What if for every new thing we were required to care for the old too? The readings for this week all suggest personal focus as a way to start spreading change. Constraint and upkeep play a role in focusing as well. If one place is to become better the answer may not always be found in introducing something new. Evaluating what may already be an asset is a great place to start. How would I promote work that is utilizing and developing my facilities while encouraging others to do the same? People are more interested if it involves them personally. Encouraging action on what interests everyone by opening discussions is a way to communicate compromise. Working toward an end date so that things get finished is also key. Sourcing local thought, labor and materials reinvests money spent back into the community. Compromise and communication offer opportunities to grow creatively and discover what we are capable of doing together.